As the holidays whoosh around the corner like Santa’s sleigh, I reflect fondly on childhood Christmases. What were the holidays like for you? Penning my latest Marjorie Gardens Mystery brought me closer to our favorite defense attorney, Isis Ferrelli. She had much to reflect on during this season of giving, and even more to be thankful for at the end of her Christmas tale. Let’s take a look at how her thoughts went from Ba Humbug to the Bells of New York City, in this latest Digital Age Cozy… A Killer App. The morning of Christmas Eve was always the best for me as a kid. Fernozas from far and wide filled our narrow Victorian home in New York. My mother and aunts cooked the whole day. The house remained infused with the aroma of savory and sweet baked goods. For hours, my father and uncles talked shop, a mixture of arguments over money and laughter. My brothers, cousins, and I bubbled with holiday excitement. With hoots and hollers, we ran up and down the stairs during games. We charged out of the house and into the snow, then back inside again. Everyone would compare us to those “kids raised in barns”. We never remembered to close the door behind us. Instantly worrying about my brother’s latest involvement with our uncle made me reminisce to when we were kids. As the youngest, he was always a rebel. Every childhood Christmas, some sort of sibling dispute broke out between him and Antonio. Being the middle child, I was caught up in their brawls. Sometimes, I was able to separate them. During others, I had to battle them both on my own. But there was never any mistake about how much we loved each other. Even when Junior refused to abide by our father’s rule: Avoid any business with the other Fernozas at all costs. Born on Christmas, I was the kid cheated out of presents. My brothers got gifts twice a year. Mine counted for two occasions. For once, I wished I could’ve enjoyed a birthday that was solely mine. No chance of that happening, the only bright side was when Antonio got older. He complained of having suckier Christmases than me. My father started grooming him to take over the family restaurant. Poor Antonio received chef hats, aprons, and cooking utensils. Of course, it’s silly, looking back on it now. Back then, not so much. No, now there’s a whole new pain for me as a grown up. Mama Ferrelli was a stickler for having the perfect decorations. And she made our home a yuletide wonder with panache. But it was never simply a Christmas celebration. There were always balloons and a Happy Birthday banner wrapped around the spruce tree for me. She tried her best to give my day. I’m fully aware I was one of the most fortunate girls on the block. And all I could ever wish for now is….I want my mama. Poor Isis! Many of us can relate to being separated from family during the holidays. But I promise you this is one story with a loving and remarkably happy ending. So, go and grab an eggnog, cozy up in your favorite chair by the fire, and read the latest adventure to hit Point Shirley like the snowstorm that turned Deidre Mason into a snowman. The holidays are coming at us full-steam ahead. Point Shirley residents are ready…well, except for Isis Ferrelli. Let’s help her out. 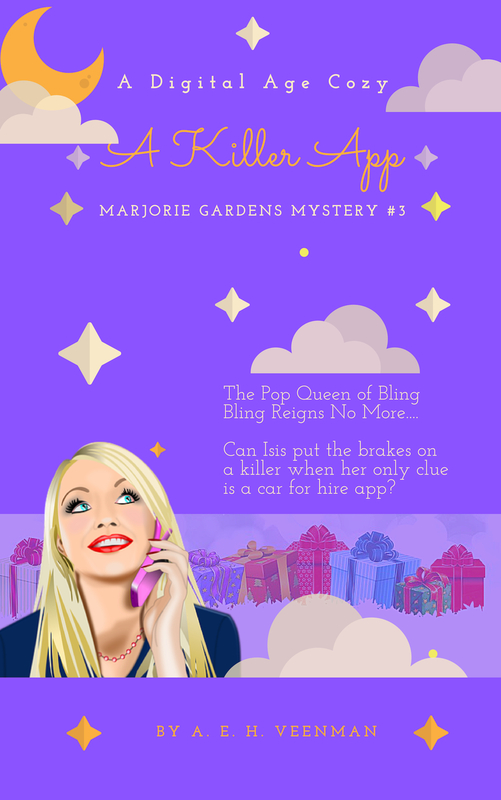 First, I’m thrilled to present the book cover for A Killer App (Marjorie Gardens Mystery #3). I was lucky to be part of a fantastic Facebook Group, where members voted on two versions of the cover. For a while, it seemed Cover #1 would be the winner with a wide lead. But soon, votes for Cover #2 picked up momentum! Thankful for the input I received from cozy mystery readers, I was able to combine both covers into a creation I’m proud of. Next, how do we top off a gorgeous cozy mystery book cover? With a video, of course! 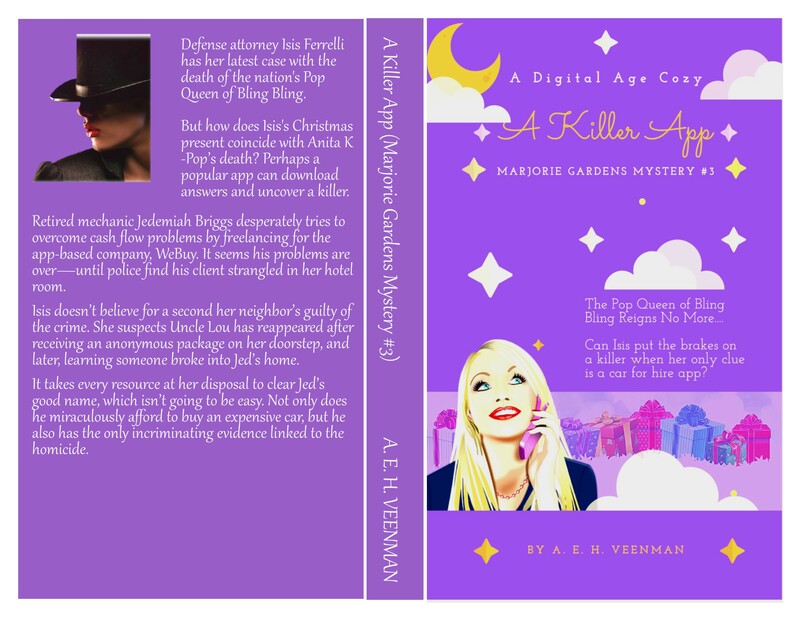 A Killer App (Marjorie Gardens Mystery #3). Defense attorney Isis Ferrelli has her latest case with the death of the nation’s Pop Queen of Bling Bling. But how does Isis’s Christmas present coincide with Anita K-Pop’s death? Perhaps a popular app can download answers and uncover a killer. Retired mechanic Jedemiah Briggs desperately tries to overcome cash flow problems by freelancing for the app-based company, WeBuy. It seems his problems are over—until police find his client strangled in her hotel room. Isis doesn’t believe for a second her neighbor’s guilty of the crime. She suspects Uncle Lou has reappeared after receiving an anonymous package on her doorstep, and later, learning someone broke into Jed’s home. It takes every resource at her disposal to clear Jed’s good name, which isn’t going to be easy. Not only does he miraculously afford to buy an expensive car, but he also has the only incriminating evidence linked to the homicide. Phantom percussion thumped softly as I came around, wiping granules of sleep from my eyes. The windows were black, a wintry chill nipping at the panes. I picked up my smartphone from the bedside table. It was six-thirty on a Saturday morning. Old heating pipes in the walls kept the beats coming. I set the mobile down, wrapped up in my blanket like a cozy pill, and waited for sleep to swallow me. Then the room’s cast iron radiator started to hiss like low-hat cymbals. I had enough. “Thank you, Point Shirley, you’ve been a great crowd.” I yanked the covers aside, grabbed my phone, and made my stage exit for the kitchen. Downstairs, automatic lighting beamed on like a summer sunrise. I floated around drowsily in bathrobe and slippers and prepared a pot of hazelnut coffee. The living room remained fairly warm although the fireplace had cooled through the night. I picked up a dusty box I’d hauled from the attic yesterday, carried it over to the couch, and opened the flaps. Christmas lights tangled with red, green, and silver garland created a huge tumbleweed in the box. I dug through and picked out a couple of old birthday greetings. I read my brother Antonio’s card first. His penmanship was awful. Luckily, he wasn’t the sentimental type and wrote two simple words. In a corner of Romano Junior’s card, he sketched a tiny hand flipping me the bird. It brought a smile to my face. Childhood mementos were nostalgic, bittersweet since I cut ties with my family. But I couldn’t linger in the past for too long. I had a job to do, and a certain someone was bullying me to get it done. This afternoon, Jason Shahaman wanted to see the halls of my moderately sized Colonial home fully decked. The Shaman, my nickname for the district attorney, had ways of getting on my last nerve—in and out of the courtroom. After a shower, wardrobe change, and my first cup of brew, I stirred up the holiday spirit to get me going. An automatic air freshener spritzed an apple cinnamon scent throughout the living room, and a smart speaker streamed Smooth Christmas Jazz. I was ready. I sorted decorations into piles on the floor, seating, and side tables. Early into the task around seven-thirty the phone rang. The smart speaker obeyed and I answered my mobile. Naturally, it was Jason. We spoke a while until the sole purpose of his call became clear. He was checking up on my progress with decorating. I was in the throes of untangling a silver garland when I cracked. “Let’s get this straight. I don’t do Christmas!” I then immediately recalled I caved in to peer pressure. “Since when?” He had a snarky, unbelieving tone in his voice. I lost my nerve to explain to the Shaman what truly pained me about the holidays. My brothers, cousins, and I bubbled with holiday excitement. With hoots and hollers, we ran up and down the stairs during games. We charged out of the house and into the snow, then back inside again. Everyone would compare us to those “kids raised in barns”. We never remembered to close the door behind us. It was way too early for any of this. I hung up and set my phone down then stretched out on the couch. She replied in a silky voice, “Why certainly, Isis,” and there came a honey-soaked saxophone solo of The Christmas Song. “MG…” I kindly asked her to shut herself down, taking the music with her. I heard a car engine idling outside then footsteps clamoring from the porch. There was a slam! Eight months ago, there was an unexpected knock on the door. Instinctively, I yelled from the dining room for Deidre Mason to come in. When the person simply departed, I realized my late-night visitor wasn’t her. I went out on the porch and found an envelope that contained overlooked evidence from two murders. Both homicides involved a man called ModuCode Killer, a member of my crime blog MyThugShot.com. Currently, I hopped onto my feet and spied through the window. A muscle car sped from the curb, mere seconds after I caught a partial plate number. It ended in 998. Racing out onto the veranda, I stepped over a rectangular shaped Christmas present and sought out my Secret Santa. All I saw was the sleigh speeding away, chugs of ivory funneling in the cold. Along Tafts Avenue, colored lights lay like nets over gray-shingled homes. Lawns with flagstone borders were wintry stages for plastic snowmen and nativity scenes. Even the City shelled out funding for red ribbon and lampposts bows. The joyous season was embodied all around me. Yet, the hairs on the back of my neck bristled as I picked up my mysterious package. I shook it a bit and then pressed it to my ear. No ominous ticking, I brought it inside and locked the door. I could hear him grin. “Right,” I drawled and inquired if he still kept evidence bags and gloves in his Lincoln Town Car. “Jason?” There was static and then three beeps. As forewarned, the line had disconnected. “Thanks for that.” I pocketed my mobile. I came up with the perfect present in retaliation for his breaking our no-gifts policy. I would buy a set of matching satellite phones. If my stay at the Reebok Refuge Silo taught me anything, it was to be prepared. But the incident there occurred five months ago. I wasn’t in the least prepared for what was happening right now. How would I get to whatever was inside the mystery box without contaminating evidence? I improvised with a pair of winter gloves from my coat pocket and carried the package into the living room. I felt silly, but I had a greater worry. Despite a statewide BOLO, ModuCode Killer roamed free. His whereabouts were last tracked to Point Shirley. My neighbor Lee Canfield lost the trace after that. ModuCode Killer had already located my office. That was bad enough. But if he drove the muscle car I spotted minutes ago, he had now discovered where I lived. I sat on the couch and stared at the gift on the coffee table, a twinge in my gut. I plucked a tiny envelope from the glossy wrapping and opened it. The typed message on the card read: Happy Birthday…LF. In five days, Isis Ferrelli would turn thirty-seven years old. That was the story as far as my colleagues and neighbors went. Truth of the matter was I was born Isis Maria Fernoza. And I would be forty on December twenty-fifth. The only people who would know that were my law firm partner Sam French, Jason, and the family I tried to escape. I unwrapped my gift and saw the words, LA FERLA, embossed in satiny red cursive on a shoebox. “You’ve got to be kidding me.” I unpacked a pair of ankle boots with two-inch heels. Shoes played an integral part in my investigations before. A man’s loafer served as a prelude to news that my client, Norman Kane, had been shot. Then the item became a significant clue in finding his killer. The next occurrence involved a pair of hunting boots. They were the root of a botulism scare at the Reebok Refuge Silo, a survivalist compound underground, where one man ended up dead. I had enough of footwear, but it seemed someone didn’t think so. I went to great lengths to hide my true identity from friends. I even managed to distance myself from my uncle, Louis Fernoza. Or, so I thought. Being an heiress to the Fernoza Family mob once had its perks. Since then, I ditched assisting the crime syndicate’s defense attorney and was promoted to Partner at McCarter and French LLP. I now feared my birthday present was a message. Uncle Lou disapproved of my career change. And he wanted to share his sentiments with me, personally. Sooner, rather than later, I was going to have to pack up and leave town. Again. At eight-thirty, an engine droned in the driveway then shut off. I glanced out the window at a black Lincoln, scuttled into the foyer, and let Jason in. He was a welcomed gift himself, nicely wrapped in a crimson shirt, ivory tie, and dark blue suit. “I was in a hurry.” I snatched off my woolly mitts and stuffed them back in my coat pockets. After all, I was becoming a pawnbroker of evidence in a most ominous pattern of one gift-one kill. We traipsed into the living room and Jason froze at a pit of broken Christmas lights near the television. He turned and lifted a questioning brow at me. Hope against hope, I should’ve known it was too much of a stretch. We sat and eyed the box on the coffee table. “Well, what do you think?” I showed him the card and mentioned the boots had come from La Ferla. “For the love of God, Isis…” His tone wasn’t dismissive. He was genuinely concerned. I used to shelter him from my Fernoza past. It was my way of protecting him. Yet, last April, I was unable to shield him from his encounter with Norman’s killer. Since then, both of us were on the lookout for signs of Uncle Lou’s reemergence. The smart speaker chimed to life. “How may I assist you, Isis?” Jason grinned and crossed his arms. “My pleasure,” she announced and dimmed her lights. “I’ll have to play it by ear.” I packed the ankle boots, stood, and then lifted the box. “And we know where the last one got us.” Jason stood beside me as he peeled off his gloves, loaded a program on his mobile, and scanned the code. A digital marketplace opened a software page on his phone. I tucked the card and paper in my Dolce & Gabbana purse while Jason retrieved our coats. Outside, crows cried from their perches on stark white oaks. Jason and I got in the Lincoln and traveled onward for little over a mile. The wet dormant air seemed to freeze before our eyes, clouds like scoops of ice cream. Seagulls braved the cold in search of a nibble at Deer Island Park. “I hope we can clear up whatever this is before the weather hits us hard.” I stared at the shoebox on my lap, lifted a corner of the lid, and peeked inside. I was learning Louis Fernoza had a knack for irony. He left a trail of breadcrumbs toward Norman’s killer. All along, he was instrumental in events leading up to the murder. Another instance, he discovered I wasn’t merely Isis from his lawyer’s firm. I was Isis Maria, his estranged niece. He didn’t come after me as I had feared. Instead, he disclosed my cell number to my mother who I hadn’t contacted in seven years. “You can’t keep them.” He chuckled as I ogled the boots once more, closed the box, and turned on the radio. At that exact moment, a song with monotonous beats and droll lyrics was winding down. “Who cares?” He reached for a preset button to change the station. He didn’t have to touch a thing. The music faded out, and a brash energetic advertisement stormed in. During five consecutive commercials, I tried to recall the artist and her chart topper. When the marketing stream finally ended, the DJ returned and recapped the hour’s playlist. “Wow…” I stated liltingly. The song obviously gave him an emotional sting. As we entered the tunnel, static scraped the speakers and the radio signal dropped. It was the perfect opportunity to dig a little into Jason’s past. In July, he and I spent ten wonderful days in Tahiti. I came to know more about him, things I wasn’t aware of. But we never ventured into talking about our exes. For a minute or two, I nagged him until we came out the other side of the tunnel. As we approached the William F. McClellan Highway, the radio signal strengthened. Jason held out his hand and shushed me. “Did you hear that?” He raised the volume for the nine AM news break. An important announcement took over the airwaves, distracting us both from the topic of old heartbreaks. Agneta Wolonovski, better known as Anita K-Pop, was found strangled inside her Weston Hill hotel suite last night. The twenty-three-year-old rose to stardom after media exposed her courtship to NBA All-Star Jesse Terrence on Valentine’s Day last year. On the morning of May twenty-eighth, every celebrity hound woke to reports that the couple’s relationship was no more. Anita responded five months later with her single, Baby Needs a New Pair of Blues. The song reached number one on the US dance charts within days of its release. Favorable among fans were the tongue-in-cheek lyrics attributed to her breakup. Today, December twentieth, faithful followers learned the tragic news of their beloved Pop Queen of Bling-Bling. Police in the Copley Place area have yet to comment on the investigation. Speculation surrounding her death is already sending shockwaves over social media. Near Copley Place, the Back Bay area was Boston’s high-end shopping district, a couple miles from the hotel mentioned on the radio. Designer names such as Louis Vuitton, Christian Dior, and Giorgio Armani appeared on windows of small boutiques. I stepped out with a view of the recreation area and esplanade across the street. Lanes for the North 1A tunnel out of Boston were entirely clear. No one was leaving the city for the time being. A flash popped on the edge of my vision. I followed the sun glare on glass to the doors opening at La Ferla. There, a lake-sized mob of teens and twenty-somethings was waiting to enter. They wore tight midriff jackets, striped beanies, skinny jeans, leotards, and miniskirts. They had essentially created an ad hoc Fashion Week. Nearing, I heard a few girls erupt in song. They squawked the catchy refrain that had been playing on the radio. Baby needs a new pair of blues. I waded through the surf of wannabe models too busy with smartphones to give me any grief. When I reached the front of the store, my smooth swim through hit rough waters. I could’ve dished out some choice words for him at that moment, but I reconsidered telling him a thing or two. The poor man may have been dealing with this crowd as soon as news of Anita’s death broke. I spun on my heels to leave. A crime scene that claimed a victim of notoriety was prime hunting ground for reporters. In this case, the Weston Hill must have seemed like a battlefield. Platoons yielding microphones and cameras, instead of weapons, kept the singer’s admirers from the front lines. The hotel may have been off limits to mourners, but not nearby locations. Surrounding areas should’ve been free and clear. Of all places, why did these kids come here? I couldn’t shake the feeling they knew something I didn’t. I slowed my pace when a white compact vehicle stopped abruptly in traffic to let a female passenger out. She closed the door, and the car proceeded onward. The woman wore black leather boots that laced up to the knee and olive army fatigues. Neon pink and blue streaks ran through her blond hair. And she had giant hoop earrings on that bounced as she trotted for the sidewalk. I seriously doubted she was in the military. She appeared more like a rock star. If anyone notable, Anita K-Pop fans would flood upon her presence. Instead, they parted like the Red Sea. It seemed she wasn’t famous after all. Yet, she showed the guard a square card, the same size as the one on my mysterious present, and he opened the door for her. The holly design I saw on the back meant it was a Christmas card. And something on its interior granted her instant access like a backstage pass. I reached into my bag, fished out a pair of dark shades, and slipped them over my hazel eyes. Shoebox under my arm, wrapping paper in hand, I strutted back to the store. I let the security guard get a good look at the gold D&G emblems on my purse and sunglasses, hoping to leave an impression. Then, with a flair of sophistication, I flashed him the QR code. I didn’t make as great an impression as I’d hoped, but I made into the realm. Inside felt like an oversized dehydrator. The morning sun seared the windows and glared off white acrylic walls and Lucite columns. I unbuttoned my coat, removed my glasses, and glanced around. A fraction of fashionably dressed youngsters were lucky to make it through the door. They hungrily snatched clothes from hangers. Older and more debonair women partially hid their visages with scarves as they perused the lingerie sections. Then, I noticed the Average Joe shoppers. They adhered to a no-nonsense dress code, checking out sale items and referring to lists to make their selections. The stark difference between customers made me wonder if I was in the company of WeBuyers. How many, if not all, used QR codes to get in? It was high time to see if my own barcode helped in figuring out Uncle Lou’s gift. I navigated toward the checkout line. There, a tall slender woman wearing an impeccable skirt suit stood behind a pearlescent counter. She bore a striking resemblance to a certain Irish singer, shaved head and all. She was scanning price tagged clothes for the squawking trio I saw earlier. The girls wore earbuds and bopped their heads, likely to another round of Baby Needs a New Pair of Blues. “Can you believe this?” came a disgruntled voice behind me. I turned toward a hulk of a man with gray stubble salting his jaw. He fanned his insulated shirt against the black tee underneath, and cigarette odor rose in waves. The cramped boutique was sweltering, but it was no excuse for rudeness. The store associate lifted a fine-penciled brow a la blasé, packed the last item for the girls, and slid the bag pleasantly to them. They trotted off, none the wiser to the man’s outburst. “Not at all, except for getting them from someone I wish I hadn’t.” We indulged in polite chuckles. “Can you verify who bought these for me?” I asked. She removed the boots, flipped the box over, and pressed the price label on the counter. A built-in screen scanned it and her computerized register beeped. “Seven hundred dollars?” I reiterated stunned. I breathed in deeply and batted my eyelashes. Stifling my frustration, I ultimately ignored his comment and showed the QR code to the clerk. “I see. One moment.” She graciously took the wrapping paper and swiped it across the counter. I exhaled despondently. From the meager information she provided, I concluded that a client in good standing with a service like WeBuy meant someone paid well and on time. “Okay, let me think about it.” I collected my gift and turned to leave. The sales clerk snatched the note and stormed toward an aisle, her heels clicking rampantly. My lips clenched and my fingers balled into fists. I was about to give the insolent WeBuyer a piece of my mind, until I spotted Jason. He pocketed his badge, apparently having to flex judicial muscle to gain entry. From either end of our passage, we trailed a maze through patrons and met up. I relayed I had little luck with the sales associate. I wasn’t prepared to give up the boots until I learned why Uncle Lou gave them to me. We quieted as we passed security and walked out into the refreshing brisk air. We refrained from talking about the matter until we had cleared those queued to enter. Jason resumed. “Tudor wants to get a jump on addressing the public, while journalists are focused on Anita’s social media marathon. He figures a preemptive strike from law enforcement will negate any rumors.” He then told me what occurred before he arrived at La Ferla. He circled the block three times before finally zipping into a spot around the corner. That was when he answered the call from Detective Tudor. He informed Jason that several of Anita’s tweets announced her arrival at the Weston Hill this past Monday. Her “New England Holiday” was a promotional stunt for a forthcoming album. Manager Desmona Coppers anticipated a US tour to kick-off the New Year. Since the early hours, police had been scouring phones and laptops recovered at the scene. One cell clearly belonged to Anita. She’d vlogged nearly everything. There were videos and snapshots of her lavish hotel suite, royal dining experiences, and songwriting sessions. The highlights, however, were her daily wardrobe updates. A certain recording she published Friday afternoon caught police interest. Jason’s summary ended as we reached the car and climbed in. He unlocked his phone then synced a video to the Lincoln’s navigation system. The GPS touchscreen docked on the dashboard blinked on. Anita K-Pop appeared onscreen. Bleached hair yawned onto her bare shoulders. Her surgically enhanced lips were plastered with rosy pink gloss. And aqua-colored eyes peered dramatically at us with dark blue shadow and black mascara. The starlet filmed herself with tagged clothes on top of a king-size bed. She giggled and held up a sleeveless blouse with reflective gilding. The top looked like a wearable mirror. In her iconic squeaky voice, she bragged that the item and the rest of her wardrobe came from exclusive shops in the Back Bay area. That explained the crowd outside the store, what those kids knew all along. It seemed the swanky location would now be synonymous with Anita K-Pop’s death. I drew my attention again to Anita hosting her private fashion show as Jason fast-forwarded. We came upon a scene where our departed mistress of bling-bling snaked her hand through a gold-and-pearl bracelet. “Looks like. But, so far, it also seems to be the only thing stolen.” He finally started the engine then checked traffic before pulling from the curb. Air gradually warmed and blew through the car vents. I began to thaw, thinking about a coldhearted thief who possessed the snowballs to kill. Wouldn’t that person have stolen more of Anita’s valuables? I instantly answered my own question. Not unless the criminal’s sole purpose was to retrieve that specific bracelet. Uncle Lou’s Birthday-Christmas present had nudged me toward La Ferla. There, the late Anita K-Pop had shopped the afternoon before she dropped. And so far, I hadn’t received a phone call from Sam French bearing any news of a dead client. As partner, I had oversight of all the lawyers in the corporate law division of McCarter and French. None of them represented Anita. So, why was I lured into her murder investigation? How did she get involved with Uncle Lou? Furthermore, what did a pseudo taxi service have to do with her untimely departure? “Yeah?” He glanced at me then focused on the road again. He careened through the tunnel heading north for Point Shirley. Meanwhile, I swept through lines of 140-character messages and photo ops. I calculated the time of her tweet. She published the selfie yesterday at four PM. The post had a picture attached. Smiling, she snuggled the mirrored blouse. I scrolled through more online stills extracted from her video. The room where she filmed resembled a box of Belgian chocolates. The stylish leather furniture was various shades of brown. The latte colored walls blended with rich hardwood floors and ebony tables. Nothing about the scene or the text struck me as peculiar until I reached her following post. There was an animated emoticon, a small gif of a pulsing ruby heart. Tweeps, if you haven’t tried WeBuy, DO IT! I love WeBuy and that darling man saves me time to be with you! The meaning behind Uncle Lou’s gift was confirmed. Anita used WeBuy for her purchases from La Ferla. Then she was dead. But who had earned her virtual beating heart—her fans or her WeBuyer? If I were a mother in the digital age, I would warn my daughter. Public affection for a total stranger could send that person a very wrong message. Crystal Cove harbor in Winthrop came into sight as we exited the tunnel. I returned to the Twitter feed and found a tweet that made my blood run cold, published an hour later. Although fully clothed, she pressed a pink lace teddy against her body…and winked. She encouraged an older man to leave everything to his imagination, totally unaware how ominous that imagination could be. Had her innocent flirting been a dangerous seed planted in an unstable mind? 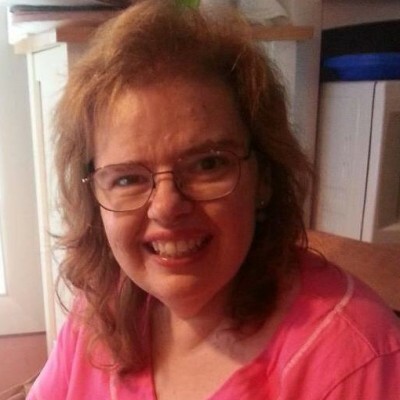 According to the report aired earlier on the radio, Anita died from asphyxiation. Strangulation was a crime of passion, up close and personal. This act was often fueled by jealousy, passion, or revenge. Did Anita entice a mature man whose fantasy she later rejected? “What!” He flashed a nervous, wide-eyed gaze. I was satisfied those bases were covered. Yet, I had a subtle feeling we were all missing a connection. My mind clunked into reverse to what I learned from my trip to La Ferla. WeBuy app users kept money on deposit. Their freelance shoppers referred to those account numbers when paying for items. 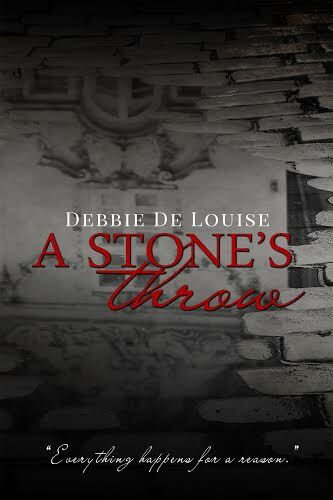 Detective Tudor’s hunt for Anita’s killer could lead him to a Have Not fed up working for one of the Haves. Nevertheless, there were other possibilities to consider. Could someone closer to Anita have set the attack in motion? The celebrity wouldn’t have had any service in her own name besides her bankroll. Her manager, Desmona Coppers, could’ve been the WeBuy account holder on record. She would have hired Anita’s driver. My brain delved deeper into the plausible yet unknown. Who was more likely to have motive in silencing the squeaky singer? Did a disgruntled freelance driver grow tiresome of scratching for a living? Or did Anita’s manager terminate the star’s contract permanently to cash-in on an insurance policy? Jason and I were in Point Shirley by the end of my quiet deliberation. He rolled the Lincoln around the corner onto Tafts Avenue. We passed Jedemiah Briggs’ house. I eyed the new set of wheels he bought in time for Christmas. A pretty decent, gray BMW sat in the driveway. I could count my blessings too. I did score a pair of seven-hundred-dollar Jimmy Choo boots. We then slowed past a home decked out in full glory of the holiday season. Deidre Mason was Point Shirley’s monthly book club host. She wowed members and neighbors alike with her German style Weihnachten theme. Life-sized nutcracker guards ranged the lawn. Knee-high, illuminated chocolate box houses lined the sides of the veranda stairs. Pearlescent garland and rich sage colored holly swaddled the banisters and porch railings. Lastly, Old Saint Nick in the green-and-white robe was a grand feature near the front door. Jason took his fine time cruising along to soak up the views. He finally parked in my driveway, and I removed my seatbelt. We got out of the car, and my phone played a symphonic theme composed by Dominik Scherrer. The tune for television’s Miss Marple Mystery was my ringtone for my good friend, Dee. She was almost breathless with panic. Jason stepped closer to eavesdrop, and we locked eyes. Nonsensically, I bobbed my head as people often do on calls. We hotfooted it toward miniature Bavaria. Deidre came out onto the porch. Her usual mushroom of ivory hair had lost its shape sometime prior and stuck flat to the sides of her plump cheeks. Her smiling green eyes were hollow, her lips forming a saturnine line. Normally, she would have held a law book or Ernest Hemingway. This bitter cold afternoon, she clutched a familiar gold-and-pearl bracelet. 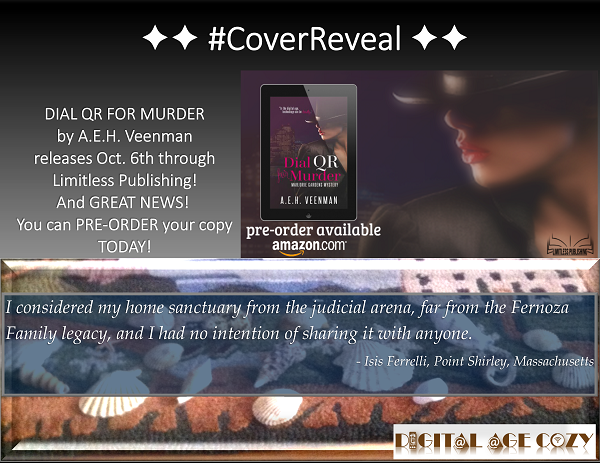 When A. E. H. Veenman isn’t writing mysteries, she’s writing music. Performing as Nene, she’s the singer/songwriter and producer for the indie alternative-rock duo, 3RD Season. In addition to Veenman’s Digital Age Cozy mystery series available, 3RD Season’s music is available online. Visit http://exobia.com to learn more. Follow me on social media to stay in the loop on the release of A Killer App (Marjorie Gardens Mystery #3). I’m thrilled to announce my Mystery Week Special: Prepped for the Kill, Marjorie Gardens Mystery #2 is FREE this week only. Activate your spyware sensors, fellow sleuths, and download a Digital Age Cozy™. “Defense Attorney Isis Ferrelli wouldn’t have believed it if she weren’t holding the purchase agreement in her hands. Point Shirley residents Raymond Lockhart and Jedemiah Briggs are purchasing a survivalist co-op. Isis must spend her vacation protecting her neighbors from a real estate scam. But she quickly uncovers there’s more going on at the Reebok Refuge Silo. The cook may have appeared harmless…until he destroys food provisions. The chief of communications learns he’s been cheated on the price of his unit and plunges the compound into radio silence. And the sickly engineer has discovered who tainted his lunch with botulism. 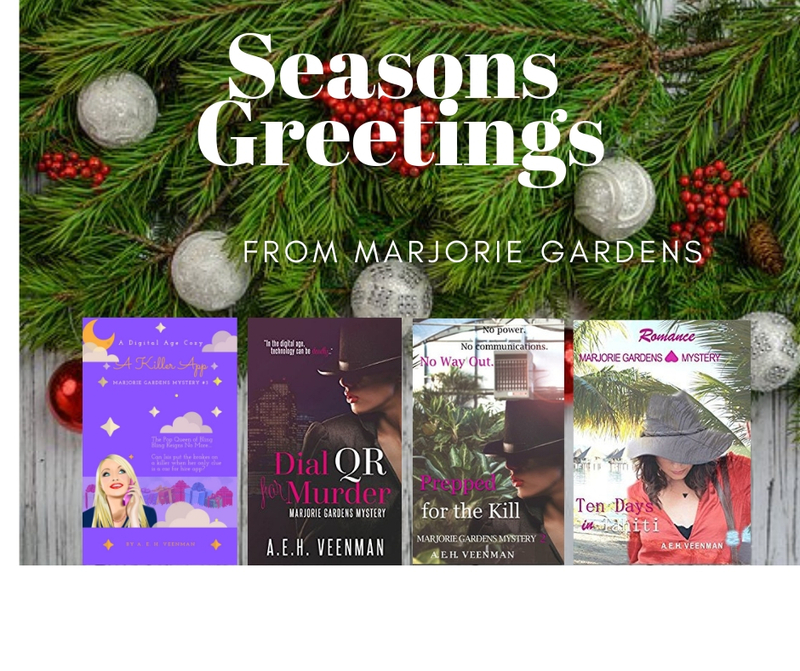 Follow me on social media to stay in the loop on my upcoming releases for the Marjorie Gardens Mystery series. It’s my pleasure to invite you all to the first Holiday Party of the Year! 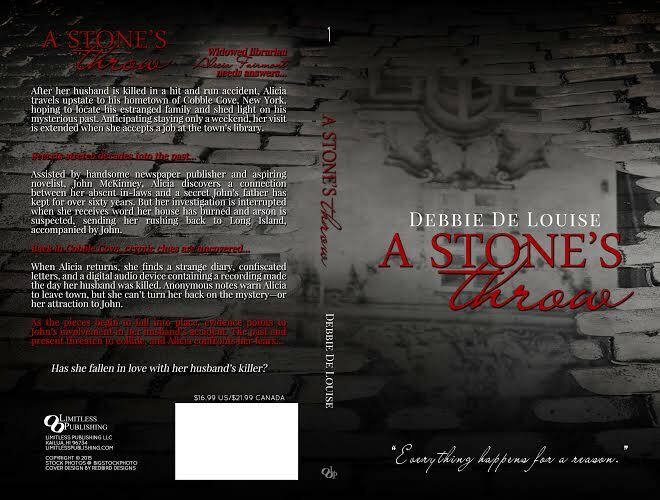 If you haven’t had a chance to learn about this writer, her romantic suspense novel A Stone’s Throw is available for pre-order now. 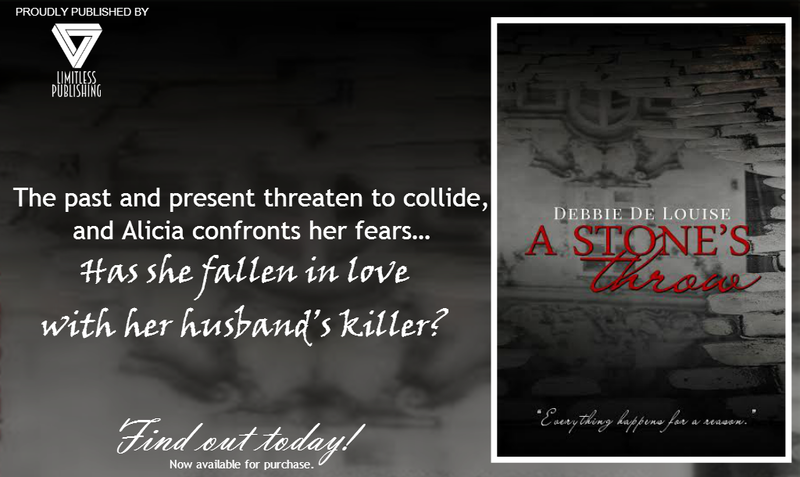 Debbie’s “throwing”this spectacular extravaganza with a scrumptious Thanksgiving dinner and delectable author takeovers with a host of amazing writers such as Sara Schoen (Amber Alert, Suicide Mission), Lori Whitwam (Fallback), Michelle Escamilla (Wishful Thinking), and Yours Truly–A.E.H. Veenman! Join me for Eggnog (spiked and virgin) and warm cozy contests where you have a chance to win fantastic prizes! 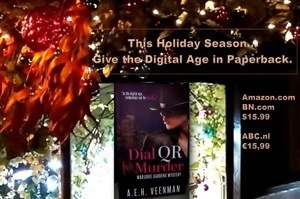 I’ll be giving away free digital copies of Dial QR for Murder…the first Digital Age Cozy in the Marjorie Gardens Mystery Series. POST THAT A.E.H. VEENMAN INVITED YOU! Everyone who joins this Facebook Event and posts that I invited them will be entered into my personal drawing to win a FREE SIGNED PAPERBACK! Winner will be selected at random and contacted for mailing address. 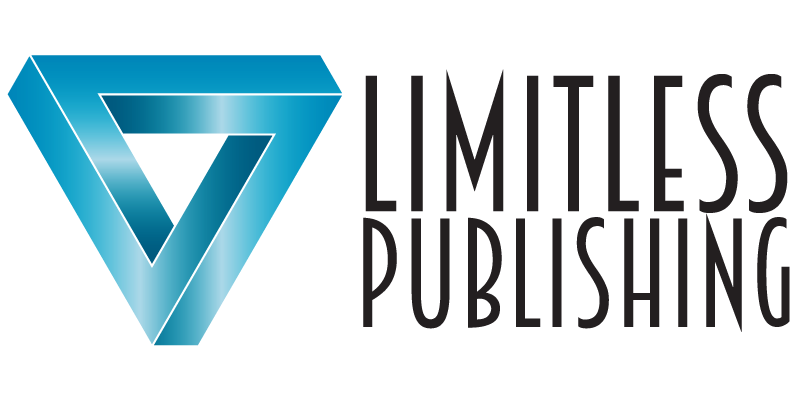 Guess who’s listed on her publisher’s website.. YAY!! For more, visit my bio on Limitless Publishing. Be sure to Like my Facebook Page!